This event only comes around once a year. Don’t miss it! to adventurous concert-goers of the Portland area. 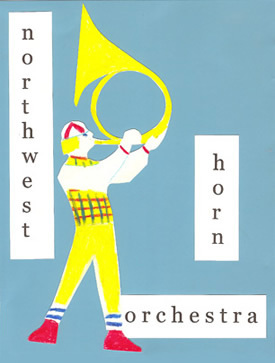 Maestro Dave Bryan and 19 French horn players from regional ensembles such as The Oregon Symphony, The Portland Opera, The Eugene Symphony, The Salem Chamber Orchestra, The Vancouver Symphony, The Columbia Symphony and other regional ensembles will combine forces for this completely unique evening of unforgettable musical offerings. This year’s program spans the genre spectrum from classical to rock to 20th century, featuring original arrangements written specifically for the group. In addition to some of the classical masters, Mozart, Elgar, and Berlioz, The Northwest Horn Orchestra will also perform Elmer Bernstein’s music from The Magnificent Seven, Michael Kamen’s Robin Hood Prince of Thieves and a surprise rock classic for 16 horns all with full rhythm section. Expect the unexpected. see our list of talented performers!